“Batman/Superman” is a monthly comic book series written by Greg Pak that launched in June, 2013. Buy signed copies at the Greg Pak Shop! Buy individual digital issues or subscribe at Comixology! Buy via mail order from Midtown Comics! “Batman/Superman” 8 page sneak peek story now online for FREE! Want to get an eyeful of the huge changes coming for Superman in June? Check out the FREE eight page preview story that I wrote and Ardian Syaf drew to tease our “Batman/Superman” book. And yes, the rumors are true: Superman drives a motorcycle over a barbarian’s face. Comments Off on “Batman/Superman” 8 page sneak peek story now online for FREE! 2015.05.29 – 05.31 – Greg Pak at the Fan Expo Dallas! Hey, Dallas! I’m coming to town! I’ll be a special guest at the Fan Expo Dallas from Friday, May 29 to Sunday, May 31. I’ll have a table in Artists’ Alley, so please come find me there to get your books signed — and to buy signed books! The con takes place in the Dallas Convention Center. Hours are Friday, 4 pm – 9 pm, Saturday 10 am – 7 pm, and Sunday 10 am to 5 pm. I should be there pretty much the entire time until about 4 pm Sunday. Comments Off on 2015.05.29 – 05.31 – Greg Pak at the Fan Expo Dallas! 2015.04.03 – 04.05 – Greg Pak’s Wondercon Anaheim schedule! Hey, California! I’m attending the Wondercon comic book convention this weekend in Anaheim! I’ll be in Artists’ Alley at table A-28 the whole weekend, right next to my ACTION COMICS collaborator, artist Aaron Kuder (A-27). I’ll sign comics for free, natch. And I’ll be selling CODE MONKEY SAVE WORLD and a bunch of my other comics. Comments Off on 2015.04.03 – 04.05 – Greg Pak’s Wondercon Anaheim schedule! 2015.04.01 – BATMAN/SUPERMAN ANNUAL #2 in stores! “Batman/Superman Annual” #2, written by yours truly with art by a slew of amazing folks, including Tyler Kirkham and Ardian Syaf, hits stores this Wednesday! Check out the lettered preview here. Comments Off on 2015.04.01 – BATMAN/SUPERMAN ANNUAL #2 in stores! I’ve got two books coming out on Wednesday — “Batman/Superman” #20 and “Storm” #9. Ask your local comics shop to hold copies for you — or buy them digitally at Comixology! Check out a preview of “Batman/Superman” #20 at CBR. Check out the “Storm” #9 preview at ComicVine. 2015.01.21 – “Batman/Superman” #18 in stores TODAY! “Batman/Superman” #18, written by yours truly with art by Ardian Syaf hits stores today! Includes the shocking revelation of exactly what’s been attacking those close to Superman! Check out the preview at Nerdist. Ask your local comics shop to hold a copy for you! Buy it digitally at Comixology! Comments Off on 2015.01.21 – “Batman/Superman” #18 in stores TODAY! A few websites have posted nice mentions of my Superman and Storm books over the last week — thanks, everyone! Buy “Action Comics: What Lies Beneath” now at the Greg Pak Shop! CBR tapped “Storm” for its Top 100 Comics of 2014 list. Money quote: “Few superheroes inspire awe in thew way that Storm does, and now she has a series that inspires as well.” The Storm book also got some nice mentions in the X-Position year-end column and Inside Joke Theater named it one of the Best New Series of 2014. Buy “Storm” #1 now at the Greg Pak Shop! “Batman/Superman: Cross World” made the Top Ten highest circulating graphic novels at the Cape May County Library, right between Bryan Lee O’Malley and Raina Telgemeier! Buy “Batman/Superman: Crossworld” and “Batman/Superman: Game Over” at the Greg Pak Shop! 2014.12.17 – “Batman/Superman” #17 and “Storm” #6 in stores today! “Batman/Superman” #17 continues the mystery of Superman’s Joker. A psychopath with power to rival Superman is murdering innocents with super-powered, untraceable bullets. Can Superman and Batman figure out who it is before the next victim falls? Art by Ardian Syaf and Sandra Hope Archer, colors by Ulises Arreola. Check out the preview here! “Storm” #6 features our injured heroine defending a plane from attackers — and sets up a massive status quo change you won’t want to miss! Art by Al Barrionuevo and Tom Palmer, colors by Ruth Redmond. Preview here. Ask your local shop to hold copies for you today or buy them digitally at Comixology! 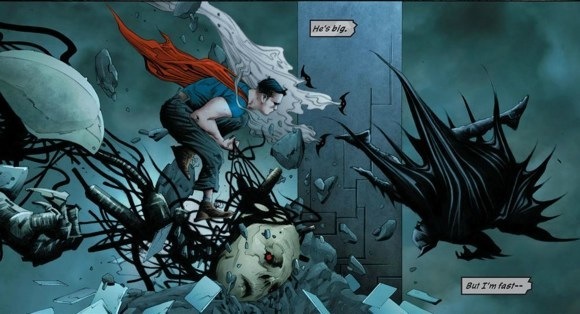 Comments Off on 2014.12.17 – “Batman/Superman” #17 and “Storm” #6 in stores today! 2014.11.19 – “Batman/Superman” #16 and “Storm” #5 in stores today! I’ve got two big books in stores today! Call your local store and ask them to hold you a copy or buy ’em digitally at Comixology! “Batman/Superman” #16, drawn by Ardian Syaf, starts a brand new storyline that asks “Who is Superman’s Joker?” Pretty darn excited about this. Ardian’s our new ongoing artist, and he’s amazing — combining some of that fine detail of Jim Lee with the expressive character work of a Kubert. Inks by Sandra Hope Archer and David Meikis, colors by Ulises Arreola, letters by Rob Leigh, and editing by Eddie Berganza. Check out the preview here! “Storm” #5 features our hero cutting loose in the death fields of the Four Clans — possibly risking her own soul while finishing her dead lover Wolverine’s dangerous business. Art by the always stunning Victor Ibañez, inks by Victor and Craig Yeung, colors by Ruth Redmond, letters by Joe Sabino, and editing by Daniel Ketchum. Check out the preview here. Comments Off on 2014.11.19 – “Batman/Superman” #16 and “Storm” #5 in stores today!